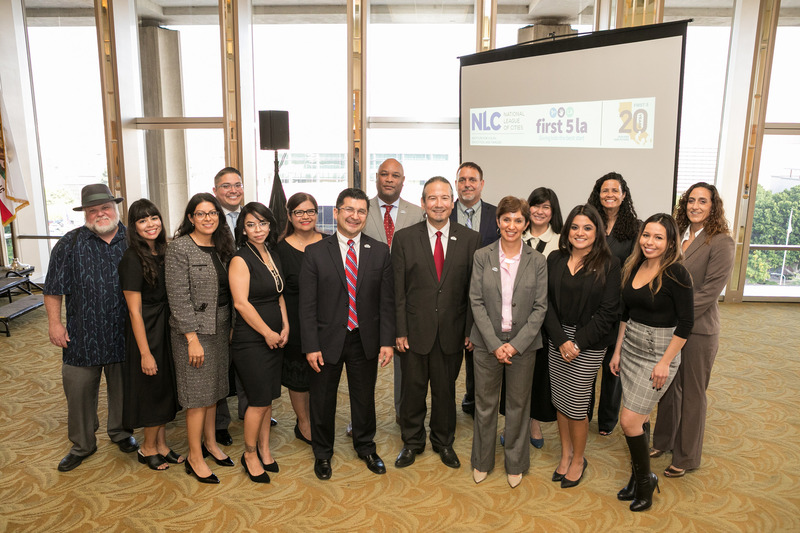 In the first convening of its kind, First 5 LA and the National League of Cities brought together mayors, city councilmembers and other officials from 10 cities throughout Los Angeles County on November 7 to learn how other cities in the county and the nation are investing in early childhood development and inspire them to take similar action in their municipalities. The event, Cities Take The Lead: A Discussion on Giving Kids the Best Start, drew more than two dozen participants — including four city councilmembers from the city of Los Angeles alone — to the Dorothy Chandler Pavilion, where they heard from a panel of experts and elected officials about how they are working to improve their city’s capacity to be a place for families and young children to thrive. 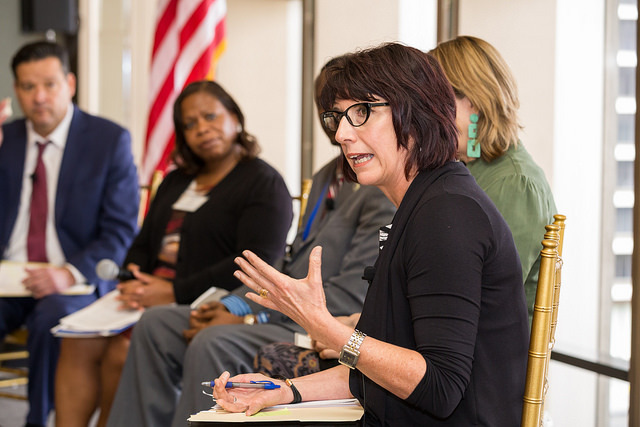 In her opening remarks, First 5 LA Executive Director Kim Belshé pointed to the agency’s clear, overarching goal, or North Star: By 2028, all children in L.A. County will enter kindergarten ready to succeed in school and life. This can only happen, Belshé stated, by partnering with parents, government, residents, service organizations, businesses and elected officials in communities in order to change policy and systems in order to improve outcomes for young children. In Dallas, Texas, for example, 60 percent of nonworking parents cite child care as one of the top reasons they do not participate in the workforce. Indeed, child care issues can impact an entire state economy: Maryland and Louisiana both lose more than $1 billion in economic activity annually as a result of child care issues. Innovative approaches to addressing such early childhood development issues was a focus of the panelists, who included Common Council President Samba Baldeh of the city of Madison, Wisconsin; Tempe, Arizona, Vice Mayor Lauren Kuby; First 5 San Mateo County Executive Director Kitty Lopez and Pasadena City Councilmember Victor Gordo. 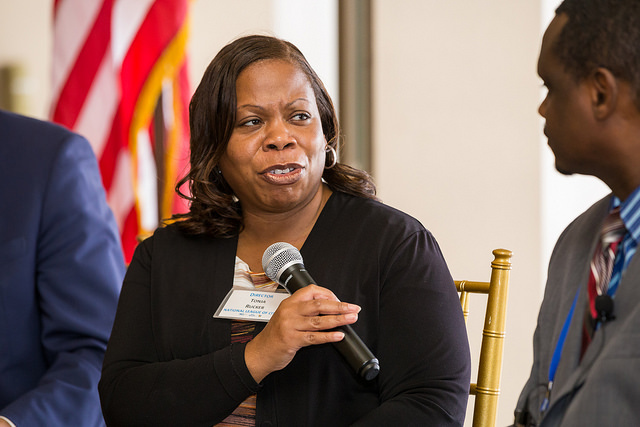 The panel was moderated by Tonja Rucker, the Early Childhood Success program director for the National League of Cities. Kuby shared the success of Tempe’s pilot Pre-K program, Tempe PRE, the first such free program in an Arizona city. After a study found that nearly two-thirds of Tempe’s children were performing below the expectations for reading and language in kindergarten, the City of Tempe Human Services department proposed a plan to improve the kindergarten readiness of children in the city by expanding access to high-quality preschool for children in low-income households. With an investment of approximately $6 million by the city council, Tempe PRE began a two-year pilot in 2017 in two school districts and now serves more than 500 families. “We’re turning away people,” Kuby said of the pilot program, which now has a waitlist. Lopez, a former second grade teacher, echoed the importance of collecting data in elevating early childhood issues. In 2015, First 5 San Mateo did a countywide assessment that found that nearly 11,000 early care and education spaces were needed for infants, toddlers and preschoolers. This data was broken up to reflect the need in each of the county’s 20 cities. Among the results was the creation of Build Up SMC, a cross-sector partnership between First 5 San Mateo, San Mateo County, philanthropy and other entities to work on closing the gap in the child care shortage. The goals of the initiative are to work across sectors to reuse/redesignate existing space to increase the number of early-learning spaces; prioritize child care in future developments; engage large employers to create child care facilities for employees; and generate revenue for facility development. In Pasadena, Gordo noted that the city was ahead of the curve in recognizing the importance of early childhood, having created its first early childhood policy in 1988. Yet, as recent as 2013, an assessment revealed that of the 8,250 children ages 0–5 in the city, 4,800 of them lived in poverty — and all of these were deficient in some way as they went into kindergarten. These new economic and educational statistics — along with data revealing a high incidence of diabetes among young children — was very compelling, Gordo said. Most recently, Pasadena created the Office of the Young Child and became an “Early Learning City” in 2017. Through its Child Care Assistance Program, the city of Madison, Wisconsin, provides financial assistance to low-income families in the city that are ineligible for the Wisconsin Shares Child Care Subsidy program and meet the City of Madison eligibility requirements. Additionally, the city’s Child Care Program established a voluntary accreditation process based on a set of quality standards to support and promote high-quality child care and early education for children and families in the city. “Our experience has been that if we provide early care services to young kids, they will grow up to be productive citizens,” Baldeh said. First 5 LA Community Relations Director Rafael González, whose department coordinated the event with the National League of Cities, said that this event is only the first step in developing a dialogue with local leaders on the critical role they play in improving the lives of young children. The panel discussion was a stimulating experience for many of the elected officials in attendance. “It was cool to see the possibilities that cities can take in filling the gap on what school districts can do,” said Pico Rivera Mayor Pro Tem Brent Tercero. Rucker noted that schools are often open to the help. “Schools often feel under siege and when cities reach out and say, ‘What can we do to help?’ it’s been really successful,” she said.